PPMA Show 2017 returns to the NEC, Birmingham this September, showcasing the latest developments in processing equipment and technology for the food, pharmaceutical and chemical industries. The event, held 26 – 28 September, sees a wealth of world-class suppliers come together to share and discuss the latest products, market trends and trade secrets. Russell Finex will present its range of innovative and award-winning industrial separation solutions suitable for a variety of processing industries. PPMA is the UK's trade association for suppliers of processing and packaging machinery to the UK market and represents over 480 member and associate companies. The association promotes its members’ products and services both at home and abroad, as well as providing free technical and machinery information and advice, and sharing the latest industry developments and technologies. As its flagship event, PPMA Show provides the perfect opportunity for PPMA members and associates as well as other exhibitors and visitors to share knowledge and discuss their latest ideas and advancements, as manufacturers continue to drive the process industry forward both at home and abroad. Russell Finex is looking forward to attending this landmark event, and showcasing the latest separation equipment, whilst offering the perfect chance for visitors to view, discuss and try the latest sieving and filtration solutions. PPMA Show also coincides with the 2017 PPMA Group Industry Awards and, having been successful in winning two industrial manufacturing awards at last year’s event, Russell Finex is looking forward to hopefully enjoying further success this time around. As always, a team of machine experts will be on hand at the show to provide advice and insight on the most suitable separation solution for a range of wet and dry materials, with a variety of upgrades and customized options available to suit the exact needs of specific applications. - The Russell Compact Sieve®: These high-capacity vibratory screeners offer increased throughput within a hygienic, compact design. Available in fully-stainless steel, with minimal contact parts and bug trap areas, these sanitary sieves deliver maximum hygiene, suitable for a variety of industries, fitting into any part of a production line. - The Self-Cleaning Russell Eco Filter®: These in line industrial filters ensure operator safety, with a fully-enclosed design. An innovative self-cleaning system means no downtime to strip down and clean cartridges, and a range of sanitary and high-temperature models are available. - The Russell Liquid Solid Separator™ - This unique high-performance centrifugal separator for continuous removal of soft or fibrous materials is suited to a wide range of applications, and can achieve flow rates of up to 100,000 l/hour on fine meshes down to 20 micron. - The Finex Separator™ - This grading separator provides large improvements in sieving accuracy, capacity, noise levels and upgradeability compared with traditional spring mounted machines. Typically used for grading up to five fractions of wet or dry material, the range of vibratory separators can be applied to other separation methods such as dewatering, de-dusting or product recovery. The Russell Screen Changer™ - The winner of the PPMA Group 2016 Most Innovative Ancillary Equipment Award, this screen deck lifting device improves operator safetyand usability, plusreduces production downtime. The easy-upgrade design is retrofittable to any round separator, and can be easily transferred from one unit to another. Russell Vibrasonic® Deblinding System - This ultrasonic screening technology enables fine mesh sieving – down to 20 micron - of difficult powders. By applying an ultrasonic frequency to the screen, mesh blockage is eliminated, meaning increased sieving throughput and increased production rates. 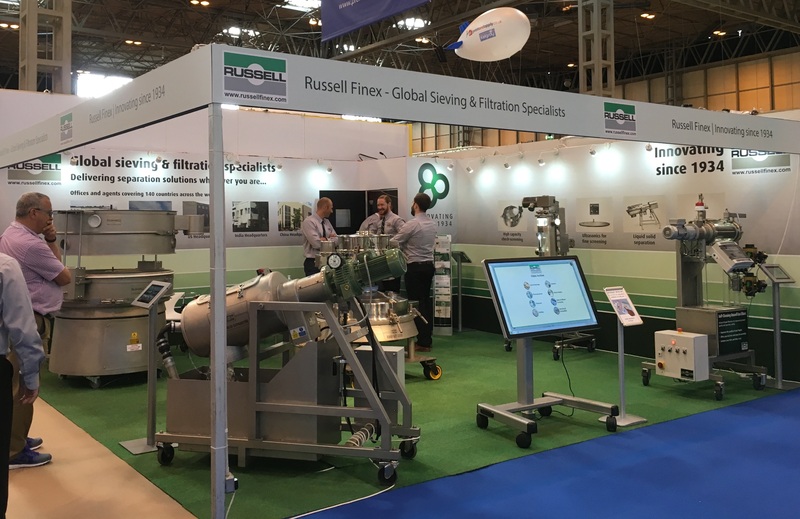 Visit Russell Finex at Stand B40 to find out how a range of innovative and customizable separation solutions and upgrades could benefit your production line, or try the online Interactive Application Finder now to find your most suitable machine.